Herbs, rarely subshrubs; caulescent, erect or creeping, or acaulescent, rosulate or unifoliate; annual, perennial or monocarpic. Leaves opposite and petiolate in the caulescent species (very rarely alternate and sessile, and then the flowering axis with a very large basal leaf); in the acaulescent species the leaf may show continued growth from a basal meristem, evidenced by wide-spreading lateral veins and frequent absence of intact apex; indumentum of simple glandular or eglandular hairs, rarely of branched hairs; sessile or subsessile glands usually present: the lower surface of the leaf sometimes white-dotted due to the presence of stomatal turrets. Inflorescences axillary or apparently from base of lamina or from leaf-stalk; cymose, branching, sometimes more or less one-sided, the flowers paired, rarely reduced to two flowers or only one. Calyx usually divided to the base into 5 segments, more rarely with a distinct tube and 5 teeth. Corolla gamopetalous, 5-lobed, most often distinctly bilabiate. Stamens arising at various levels on the corolla tube, the anterior 2 only fertile; lateral staminodes usually present, the posterior one often missing; filaments variable in length, often thickened in the middle; anthers with divaricate, rarely parallel, lobes, the lines of dehiscence confluent at the apex, usually cohering face to face. Disk annular or shortly cupular. Ovary usually unilocular, but sometimes apparently bilocular by fusion of the T-shaped intrusive placentae; ovules restricted to the recurved tips of the placentae; ovary narrowed, often very gradually, into the style; stigma variable. Capsule more or less cylindrical, varying from short and broad (5 mm.) to long and slender (180 mm. ), twisting spirally before maturity, dehiscing by a loculicidal slit and slight untwisting of the spiral, when old sometimes splitting into 4 valves. Seedlings with the cotyledons becoming unequal after germination. Seeds numerous, small, with very little endosperm, reticulate or verruculose. Stamens arising from within the corolla tube, the anterior two only fertile; two lateral staminodes usually present, often minute, the posterior staminode usually absent. Filaments straight to convergent, sometimes recurved. Ovary unilocular but sometimes apparently bilocular by fusion of the T-shaped intrusive placentae; narrowed, often gradually, into the style. Seedlings with the cotyledons becoming unequal after germination. 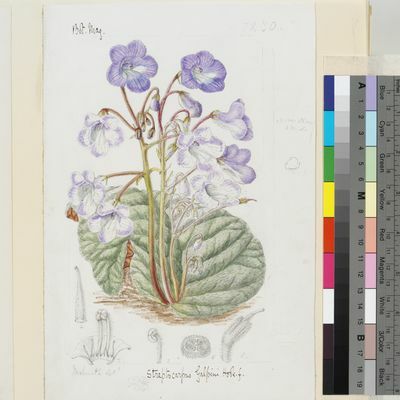 Streptocarpus is traditionally subdivided into two subgenera: Streptocarpus, comprising acaulescent unifoliate to rosulate taxa, and Streptocarpella, comprising caulescent, petiolate taxa with opposite phyllotaxy. However, although recent molecular data (e.g., Möller & Cronk in Syst. Geogr. Pl. 71: 545–555 (2001)) supports the recognition of two subgenera, it indicates that the dividing line is not so clear-cut. Subgen. Streptocarpus is found to include several caulescent taxa with opposite phyllotaxy, including S. schliebenii and S. parensis of east Africa. 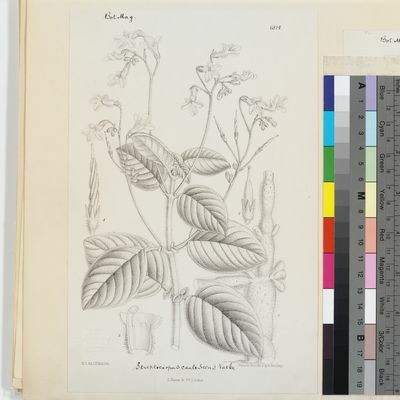 This agrees with Dr. Burtt’s initial assertion that, on the basis of flower morphology, these two taxa were closely related to the acaulescent S. montanus (in Notes Roy. Bot. Gard. Edinb. 22: 576 (1958)), and demonstrates the significance of flower morphology in recognising affinities within the genus. However, at that time it led Burtt to the incorrect conclusion that S. montanus belonged within subgenus Streptocarpella on the basis that its rhizome represented a modified form of the typical caulescent habit within this group. This assertion was overturned following further morphological study which revealed the rhizome to be of hypocotyl origin rather than being a true stem (Hilliard & B.L. Burtt, Streptocarpus: 18–21 (1971)). However, the relationship between S. montanus, S. parensis and S. schliebenii was not then revisited. 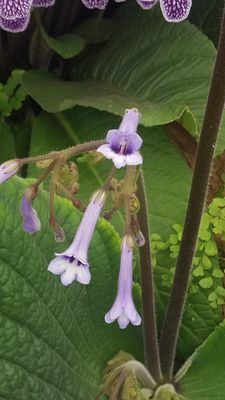 The genus Linnaeopsis Engl., comprising five taxa within three species, largely endemic to the Uluguru Mts of eastern Tanzania, is here placed in synonomy with Streptocarpus. 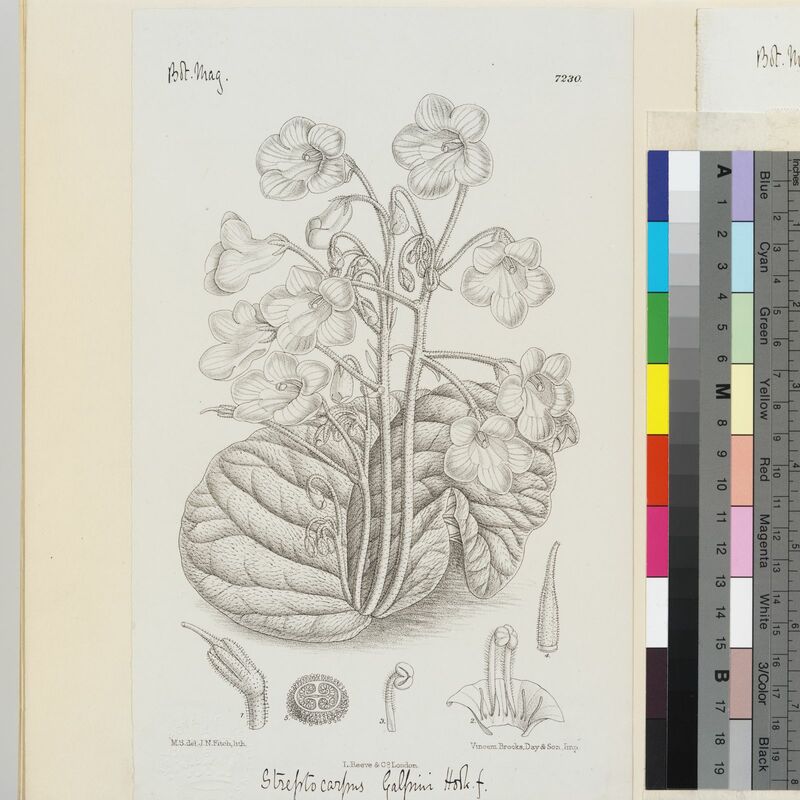 Linnaeopsis was previously separated from Streptocarpus on the basis of the alternate phyllotaxy, the untwisted capsules and the small punctate pollen grains. Whilst the former character separates Linnaeopsis from most Streptocarpus species, it is not universally applicable. 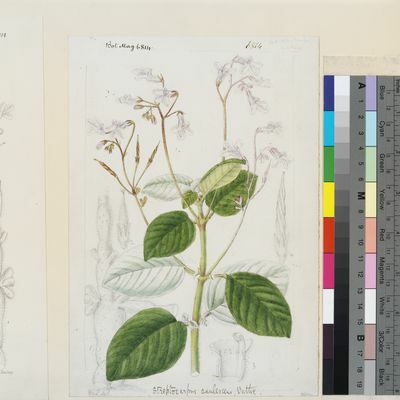 The subrosulate L. alba is very close in phyllotaxy to some of the rosulate members of subgenus Streptocarpus, and an incompletely known caulescent Streptocarpus from the Usambara Mts (sp. A here) apparently displays alternate leaves. As phyllotaxy is so variable in Streptocarpus therefore, the presence of alternate leaves seems of little taxonomic significance. Fruit morphologically is also likely of limited significance in generic definition, as not all Streptocarpus species have strongly twisted fruit (e.g. S. exsertus and S. burttianus in our region) and both L. subscandens and L. alba show some signs of slight twisting of the valves (though not to the same extent as seen in most Streptocarpus). However, the assertion by Weigend (in Flora 195(1): 45 (2000)) that L. subscandens has twisted fruits identical to that of some members of Streptocarpus may be in error; this was based upon the study of Schlieben 2936 (G) and material of the same collection from the Berlin herbarium contains a loose fruit which almost certainly belongs to a different species of Streptocarpus. In fact, in all the material seen of Linnaeopsis, very few mature fruits are available, thus our knowledge of their morphology remains incomplete. On the third point, although the small punctate pollen serves to confirm the affinity of the species within Linnaeopsis, it cannot be used to segregate this group from Streptocarpus where pollen form is diverse. Most telling in the placement of Linnaeopsis is the strong similarity in flower morphology between the five taxa and several members of Streptocarpus, having small, white, obliquely subcampanulate corollas with stamens arising almost from the base of the tube. These characters are repeated in several species of subgen. Streptocarpus and almost identical to S. bullatus, a species also endemic to the Uluguru Mts. This affinity is confirmed by molecular evidence (Möller & Cronk in Syst. Geogr. Pl. 71: 545–555 (2001)) which clearly places Linnaeopsis with S. bullatus in one of the basal groups within subgen. Streptocarpus. This conclusion further highlights the importance of flower morphology in recognition of affinities within Streptocarpus. Taxa within subgen. 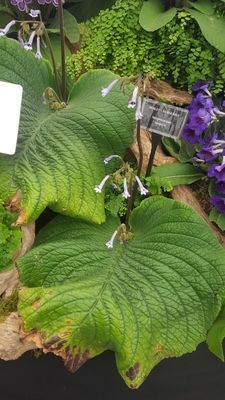 Streptocarpus often display unusual growth forms. Most commonly, during seed germination highly differential growth of the cotyledons occurs, with one developing rapidly into a large, leaf-like organ (phyllomorph) which may be held on a stalk of hypocotyl origin (petiolode). In certain species, the growth form becomes even more complicated, with vertical extension of the petiolode to form a stem-like structure (e.g. S. bullatus, S. exsertus) or fusion of multiple petiolodes into a rhizome-like structure (e.g. S. montanus, S. burttianus). For a full discussion on these growth forms, reference should be made to Hilliard & B.L. Burtt, Streptocarpus: 5–33 (1971). For the sake of simplicity, the cotyledonderived phyllomorphs are referred to in the descriptions and key as leaves, but the term “petiolode” is adopted to separate these hypocotyl-derived leaf stalks, on which the inflorescence is often borne, from true petioles. Range: A genus of over 130 species, confined to tropical and southern Africa and Madagascar. Stamens arising from below the centre of the corolla tube, the two anterior ones only fertile, two lateral staminodes present, the third, posterior one absent. Ovary cylindric, unilocular, placentae intrusive, T-shaped; tapering into the style. Stamens arising from just below the mouth of the corolla tube, the anterior two fertile; two lateral staminodes present, often minute, the posterior staminode either present or absent, one or more of the staminodes rarely fertile in abnormal flowers. Filaments straight or twisted, often upcurved, flattened, often strongly so particularly towards the base, glabrous. Ovary unilocular, short, usually densely appressed-pubescent or villose, rarely with only sessile glands. Style held to one side of the stamens, slender, largely glabrous except towards the base where pubescent. Seeds numerous, small, fusiform, longitudinally ridged and most often verruculose. With such a narrow species concept, it is inevitable that as further wild collections have become available populations of Saintpaulia have been found which do not fit easily into the current classification. Whilst this has led in some instances to the proposal of potentially new species, it has led some botanists to call for a broadening of the species concept within the genus, particularly where populations intermediate between previously discrete taxa have been discovered. Recent genetic work (for example Möller & Cronk in Proc. Roy. Soc. London, B 264: 1827–1836 (1997); Lindqvist & Albert in K.B. 54: 363–377 (1999) & in Syst. Geogr. Pl. 71: 37–44 (2002)) has further questioned the species delimitation. Having now obtained a coverage of all but one ( S. inconspicua B.L.Burtt) of the formally described taxa, the majority of “species” are found to have poor genetic differentiation, leading Lindqvist & Albert (1999) to suggest that the Usambara and coastal populations ( S. ionantha complex) may best be regarded as a single metapopulation rather than divided into discrete taxonomic entities. Under such a theory, it is the relative isolation of the different populations, rather than any significant morphologically or ecologically driven genetic barriers, which result in the large variation seen, but at least irregular interbreeding is likely continuing between these populations. This is supported by the fact that the majority of taxa cross readily in cultivation and produce fertile hybrids (Batcheller in Gloxinian 34(2): 6 (1984)). Furthermore, the fact that many of the cultivars have been produced from a single “species” ( S. ionantha H.Wendl.) indicates the potentially large genetic variability within this taxon which may be borne out within different isolated populations under varying ecological conditions. A genus endemic to the Flora region, important in the horticultural industry where they are marketed under the name “African Violet”, with over 2000 cultivars. Dr. B.L. Burtt carried out extensive taxonomic research into the genus during the 1940s–1960s, recognising 20 species with four further varieties. He based much of his work on material grown in cultivation at the Royal Botanic Gardens, Edinburgh and Kew from seeds and leaf cuttings sent by collectors in east Africa. Many of the taxa recognised were acknowledged to have very close affinity, with species delimitation particularly problematic in the east Usambara Mts. Much of the taxonomy was based upon vegetative characters, most notably habit and upper leaf surface indumentum. The flowers of the majority of taxa were found to be essentially inseparable morphologically, although corolla colour was used as a character of significance. As much of the widely distributed cultivated material was cloned from relatively few initial wild collections, the different taxa have been deemed readily separable and thus the taxonomy of the group has persisted. In light of the above discussion, the current study applies a broadened species concept and reduces the number of species of Saintpaulia from twenty to six. Of these, three ( S. inconspicua B.L.Burtt, S. pusilla Engl. and S. goetzeana Engl.) are highly distinct, whilst the remaining three ( S. shumensis B.L.Burtt, S. ionantha H.Wendl. and S. teitensis B.L.Burtt) form a complex which, taking a broad species concept, could be considered conspecific. However, the two most distinct entities are here separated at the species level from the S. ionantha group. One of these ( S. teitensis) is isolated geographically, the single population being approximately 150 km from the nearest known population of S. ionantha. The second ( S. shumensis) is isolated ecologically, being recorded from higher altitudes than geographically sympatric populations of S. ionantha. Within S. ionantha, ten entities, separable by compliments of characters which are not deemed to be of either sufficient significance or consistency to support species status, are recognised; there is a significant allopatric element to their distribution, thus the rank of subspecies is applied. In addition one variety, var. diplotricha (B.L.Burtt) I.Darbysh. is recognised within subsp. ionantha; this taxon is deemed to display an indumentum sufficiently distinct from the typical variety to warrant formal taxonomic recognition, populations being readily separable in the field (S. Simiyu, pers. comm.). Many of the other infraspecific taxa display significant variation between and within populations which could be given recognition at the rank of variety or form. However, a conscious decision has been taken not to do this within the current work. To consistently recognise all variations in, for example flower colour and size and leaf shape, would lead to the need for a very large number of taxonomic entities. It would seem irresponsible to create so many new names in this already complex group until a full and exhaustive revision has been carried out; the current treatment is seen as a first step in this process. In light of the phylogenetic data, the taxonomic significance of the characters used in the classification of Saintpaulia has been questioned. Several, most notably leaf indumentum and pigmentation and flower colour, are postulated to be under the control of very few genes (Lindqvist & Albert in K.B. 54: 363–377 (1999)). The resultant variation seen may therefore represent polymorphism through genetic diversity within a single entity. Other characters are likely to be largely phenotypic in origin, for example habit. It is quite conceivable that those populations growing in lush, sheltered environments are more likely to develop long trailing stems whilst those in harsher environments such as vertical rock faces with periodic drought remain compact and rosulate. The fact that such variation persists in cultivation indicates that the populations have begun to evolve genetically to adapt to their microenvironment. However, this persistence is inconsistent, with some plants which are rosulate in the wild becoming trailing in cultivation and vice versa ( Simiyu, pers. comm.). Similarly, the very fleshy leaves and petioles of some of the low altitude taxa persist in plants propagated in cultivation but are almost certainly of phenotypic origin. Other characters are of insufficient consistency to be applied in isolation. For example, capsule morphology is highly diverse in Saintpaulia and initially appears to be of taxonomic value. However, remarkable variation in this character is recorded even within individual populations. Within the S. ionantha-complex, there is a general lengthening and narrowing of the capsule moving from the coast westwards, but there is significant overlap between the different entities. The revised taxonomy of Saintpaulia presented here largely agrees with the genetic data, with one significant difference. Lindqvist & Albert (2002) indicate that the ionantha-type Saintpaulia taxa from the Nguru Mts ( S. nitida B.L.Burtt and S. brevipilosa B.L.Burtt) form a monophyletic group distinct from the S. ionantha complex. However, this is not supportable on morphological grounds; S. nitida (= S. ionantha subsp. nitida) proves one of the more difficult taxa to key out within the ionantha complex, particularly in dried material, and S. brevipilosa is found to display overlap with S. ionantha subsp. velutina to such an extent that it is reduced to synonymy within that taxon. Genetic data (e.g. Moller & Cronk in Andrews et al. (eds. ), Taxonomy Cult. Pl. : 253–264 (2000) & in Amer. Journ. Bot. 84: 956–965 (1997); Smith et al. in Edinb. J. Bot. 55: 1–11 (1998)) has consistently shown Saintpaulia to have evolved from within Streptocarpus subgen. Streptocarpella. This relationship is supported by morphological data, the two sharing a similar embryology and pollen type, and by the identical chromosome number (n = 15). Several morphological characters have been used to separate the two genera in the past. Authors have pointed to the principally rosulate habit of Saintpaulia as opposed to the caulescent habit of subgen. Streptocarpella. However, this is inconsistent as several taxa of Saintpaulia display caulescence. The use of fruit characters is also questionable: although Saintpaulia taxa consistently display untwisted fruits regardless of shape and size whilst those of Streptocarpus are usually spirally twisted, the occurrence of untwisted fruits in some species of the latter genus reduces the taxonomic value of this character. The only consistent difference between the genera therefore appears to be the very short corolla tube and the pollen-reward pollination mechanism in Saintpaulia as opposed to the long tube and nectar-reward mechanism in Streptocarpus. Such differences are likely a simple response to a shift in pollinator which may have been induced by the habitat specialisation of Saintpaulia (Moller & Cronk 2000). However, the resultant flower morphology in Saintpaulia is so distinct as to render it readily separable from Streptocarpus, thus Saintpaulia is here maintained as a distinct genus. Future revisional work may result in the reduction of Saintpaulia to a section within Streptocarpus subgen. Streptocarpella. Hilliard & Burtt, Streptocarpus: An African Plant Study (1971). in Bot. Reg. 14 tab. 1173 (1828).